Dog bone cancer accounts for 80 percent of all dog bone disease. Even though these tumors can occur in any bone, they are more likely to develop in the long bones of the legs. This important article will help you understand the diagnosis and analysis of bone cancer in dogs. Bone cancer in dogs is often mistaken for arthritis, sprain, hip dysplasia, patella luxation, and other orthopedic disorders. The cause of dog bone cancer remains unknown. At the time when the cancer is diagnosed, the tumor would have most likely spread to other parts of the body. 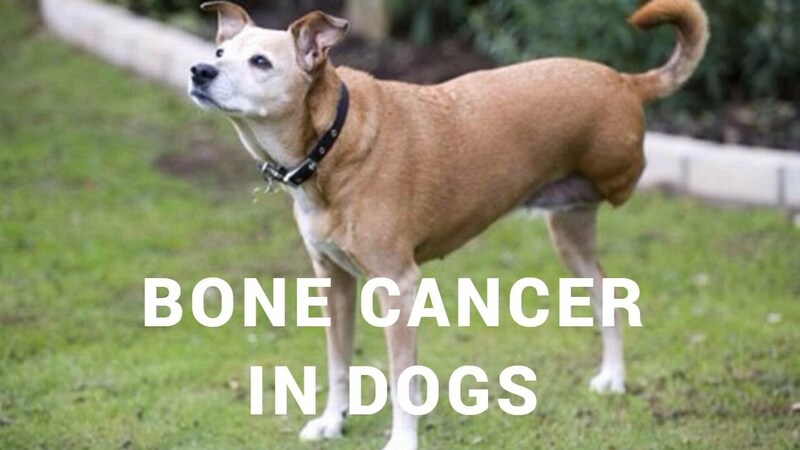 There are 6 types of bone cancer in dogs. 1, Osteosarcoma: Osteosarcoma makes up about 80% of all dog bone cancer. It affects mainly the limbs. Older (7-9 years old) and large breed dogs are more at risk. The tumor grows from within the bone and destroys it from inside out. The affected bone becomes weaker and eventually fractures. It will never heal. Osteosarcoma in dogs is very aggressive and spreads quickly, making it difficult to treat. 2. Chondrosarcoma: the second most common type of bone cancer in dogs is a cartilage tumor. It usually develops on flat bones such as the ribs and skull. Chondrosarcoma is not as invasive and metastatic as osteosarcoma. 3. Fibrosarcoma: Fibrosarcoma is rare and usually occurs in the axial skeleton such as ribs, jaw, and vertebrae. 4. Hemangiosarcoma: Another rare type of cancer in dogs affects both axial (flat bones like the spine, skull, and pelvis) and appendicular (limbs) skeletons. It is extremely metastatic and survival rate in dogs are low. Hemangiosarcoma is more likely to arise from the spread of cancer from other parts of the body than as primary bone cancer. 5. Multilobular Osteochondrosarcoma: This is a tumor of the outer layer of the bone, affecting the skull, toes, pelvis, and ribs. It is very rare, locally invasive and tends to spread slowly. 6. Synovial cell sarcoma: This type of tumor develops in the joint tissues and spread to the adjacent bones. It can spread to other organs such as the lungs and lymph nodes. The common signs are lameness, pain, swelling, fracture, bleeding, breathing difficulty, lethargy, and loss of appetite. The conventional treatment is usually a combination surgery (amputation or limb-sparing), chemotherapy, radiotherapy and pain relief medications. In most cases, amputation is the first recommended treatment to minimize tumor spread and to relieve pain. The traditional approach is good for reducing tumor masses. As the dog's immune system is compromised by the disease and drug treatment, holistic therapy is crucial for promoting immune function and overall health. This is done through immune support supplements, nutritious diet, minimizing exposure to toxic chemicals and avoiding unnecessary vaccinations.